since we pre bake the lighting into our textures we don’t use mb’s lighting. Yea, Anyone have a skeleton setup for Maya6. Does anybody have the same skeleton setup for Maya?? 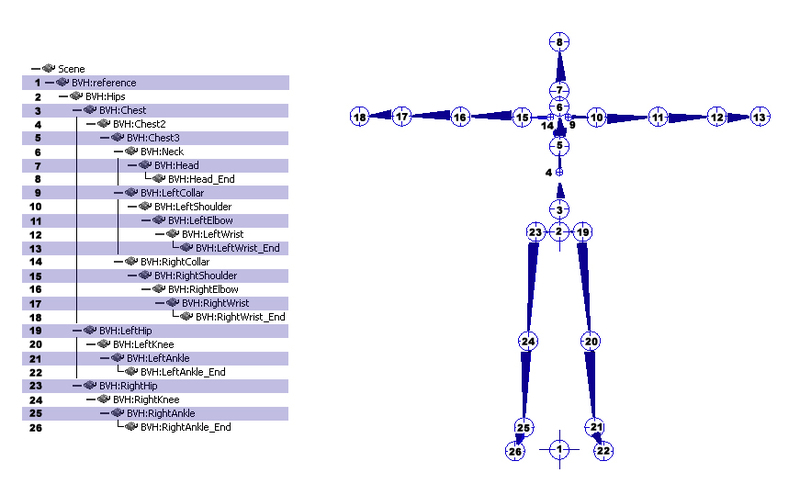 you can download a two setup skeleton from hightend 3d maya scripts animation . I just discovered something that made my day so I thought I’d share with the rest of the class. I’m animating a kid picking up a rock and carrying it. I’m not using a parent/child constraints to keep the wrist effectors in place while the rock moves all around because if I use a parent/child constraint I can’t animate the wrist anymore. What ever position I put the hand in last it stays for good because the constraint over rides all other animation. I heard multi-reference fixes this but I’m not sure how. Anyway I found something that worked perfectly. Auxilary effectors for the wrists! I just created some Aux effectors for the wrists > moved them in a good spot on the rock > hit x on the keyboard > selected the aux effector > dragged it to the rock > selected “Parent” from the menu! Then I used the “Reach T” slider to turn the aux effector on and off when I needed it, by creating key frames. I get the best of both worlds! My wrists stay where I want them and I can still animate the hand freely. I’m sure this is old news to most of you. But for some it may not be. Let me know if I’m not being clear on anything. Ever get tired of zooming, panning the perspective cam to keep up with your mocap data? This is a simple way to have a camera always track the character you’re editing. It allows you to move/rotate the cam relative to the /character object so can always adjust your view but will always follow the character. Create a null and align it’s position to the Characters root bone/effector. Move the camera so that it’s looking approximately at the characters root as in a mid-shot of a character. Ensure that the camera target is a reasonable distance from the camera body, but not too far. Parent the camera and target to the null. Position Constrain the null to the root node. You should now have a camera that always follows the character, but still allows you to orbit or zoom around the character. I know this gets asked alot but no one ever posted a working solution. Can someone please tell me how to export bvh files from MB 6 into Max 7 CS so that you dont get the naming convention error when you open the bvh file in max’s motion cap dialouge? Please be specific since there is much room for error here. If you do your keyframe animation in Story Window and maybe have different Tracks for Upper and Lower Body, make sure you have Full Body selected in one of the tracks. Otherwise the file seems to crash sometime. OK…I’m sure everyone is familiar with this interface aspect in Motion BREAKER - the surfer dude in the character controls window? Does anyone know how to change it? It would be nice if the pic reflected the character you were working on. really belief me she will like it. I’m new to MB. I have MB 7.5 and the gettin’ stratin’ guide mentions that you can plot animation back on the character, so you get back your keys and continue editing… (if I didn’t get it wrong…), so I searched within the docs, but nothing… Is it possible to un-plot an animation, to get your keys back? How? There’s a limit to the amount of bones in the .bvh format. In the image, I’ve included as many bones as possible. It’s a good idea to select the heirarchy starting from the BVH:Hips node and down when exporting the BVH file. Not sure about Max 9, but in previous versions this caused errors. almost forgot… exporting can be tricky. make sure that you select the “hips” node and then select the branches before export>bvh. if you select “reference” as well, you can get errors. You shouldn’t have any problems. One thing to keep in mind is, when characterized, if your unable to move the tail, deselect the ‘Skeleton Trs’ under ‘Show’ in the Character Control window. It’s caused others aggravation before. So, if you have one bone for each ear of a character, and want to animate it with simple FK, you don’t need to make custom constraints over nulls and the such: just add the bone to the extension and disable the option mentioned above. And until MB has support for SplineIK, it’s also usefull for rigging/characterizing a FK tail. Simply click Plot and tell it to plot to the Control Rig. MB creates a new Control Rig for you with the keyframes that were ploted to the skeleton previously. Hope I’ve been of use. 2. Click “Plot animation” and choose “to control tig” and voila - you have your new control rig with all the keys from the animation on the skeleton. Especially in the character controls this is irritating. Is it possible at all? How? In Motionbuilder, the order in which you create objects actually matters. Create an joint chain of two joints. Create a marker and place it at the end joint of chain. This is the “controll-object”. Make an chain IK constraint with the marker as effector. Make a position constraint with the end joint set as source and marker set as constrained. Click the zero button for the position constraint. Doesn’t work very good does it? You can’t really move the marker so the setup isn’t usefull. Try the exact same setup but do step 2 (create marker) before step 1 (create joints). Now that is a usefull setup, the marker works as a control object while constraining to the end of the joint-chain. Try it out!